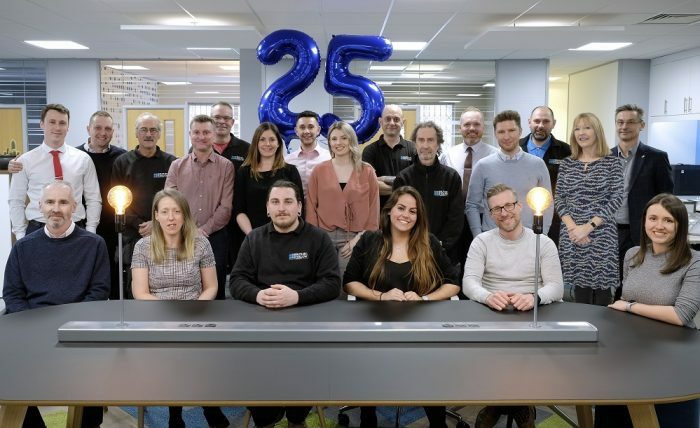 Commercial fit-out and refurbishment specialist Butler & Willow is celebrating its 25th anniversary in business, delivering effective workspaces that are more than just ‘places to work’ but places ‘people want to be’. The firm, which provides tailored workplace fit-out solutions, is marking the significant milestone with the announcement of new project wins including the UK’s largest independent car retailer Motorpoint, business advisory firm Smith Cooper, global logistics provider DSV, law firm Elliot Mather, and talent recruitment firms Talk Staff and SF Group, to name a few. Butler & Willow was originally founded by Jonathan Butler and Albert Willow 25 years ago before Albert’s son James joined around 10 years in and eventually purchased the business on its 20th anniversary. The company has since grown into one of the most active and reputable fit-out companies in the region and puts itself at the forefront of businesses requiring a design and fit-out or refurbishment of its workspaces. Having originally operated out of the family home in Nottingham, the continued success and expansion has enabled the firm to centralise itself from its own working showroom mid-way between Nottingham and Derby, in Long Eaton. Now home to a team of more than 25 renowned experts, the site has become an ever-evolving showcase of its ability. Alongside completing impressive projects for companies such as global data and technology company ERT, software developer e-days, IT solution provider Retail Assist and business advisory firm Mazars, Butler & Willow continues to provide long-term careers for industry professionals who want to become the best they can be and works closely with local universities to offer opportunities for upcoming talent. Managing Director, James Willow, said: “We are so proud of who we are and the results we can achieve. Although our arena has been unusually difficult over the last 18 months, we have actually remained in a strong position, dedicating our efforts towards developing our people and remained a solid, reliable and excellent value choice for those serious about their people and the spaces they work in. “It is not always about expensive, over-the-top, wacky gimmicks – more often it’s about transitioning existing environments a smarter way, and into surroundings that are effective in retaining great people whilst being part of the attraction for new skills, and of course working better all round. “Being reputable, flexible, and scalable has ensured that we continue to maximise on opportunities and boost our plans for more of the same. We have already secured more than £1m of local projects over the last few weeks, constantly beaten sales targets over the last quarters, and we are in line with many more opportunities – our plans to smash our £9m+ best year is driving a daily buzz here.